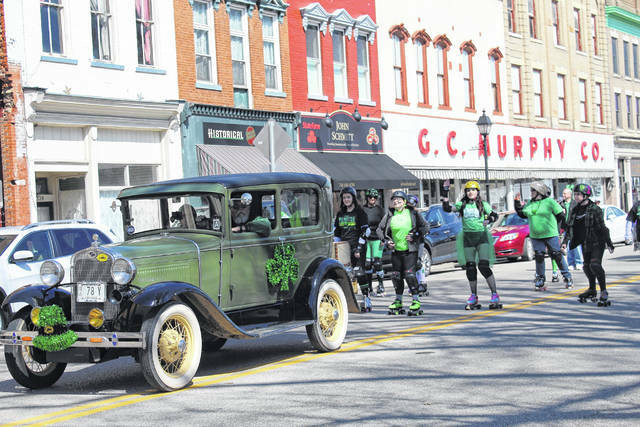 Saturday was the annual Saint Patrick’s Day Cultural Parade in downtown Gallipolis, meant to also celebrate all people and cultures. Traveling along Second Avenue, the parade serves as a fundraiser to support cultural arts non-profit work in the community by the Artisan Shoppe. Pictured is an antique car followed by the Silver Bridge Bruisers roller derby team, skating, rather than marching, towards that pot of gold at the end of the rainbow. More parade photos in an upcoming edition and online at www.mydailytribune.com.